Dr. Katherine I. Pettus, PhD, IAHPC Advocacy Officer for Palliative Care Medicines, reports on key advocacy meetings at the United Nations in July. 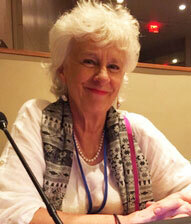 IAHPC Board Member, Mary Callaway, and I attended the Eighth United Nations Open-ended Working Group on Ageing (OEWGA). The OEWGA was formed to review the ‘protection gaps’ older persons experience in the enjoyment of their human rights, and to discuss how to overcome those gaps, including considering drafting a new international convention, or ‘binding instrument’. No such convention exists to make governments accountable for policies that respect, protect, and fulfill the human rights of older persons (those over 65). This session of the OEWGA ended with the selection of ‘long term and palliative care’ as one of two focus questions for the 2018 session (OEWG9), the exact date of which is yet to be determined. The fact that UN member states will discuss older persons’ rights to long term and palliative care for several days is unprecedented. Civil society advocates will need to spend the next year pointing out the enormous gaps all over the world in the availability of quality long-term and palliative care for older persons, and discussing how they can help our governments bridge those gaps. See my EAPC Blog post for a more detailed report on the session. A full list of Resources and Articles: Books, Articles, Statements, and Reports on Rights of Older Persons and Palliative Care is available in the Resources section of the IAHPC website. Following the OEWGA, I attended the High-Level Political Forum (HLPF) at the United Nations, where member states were discussing the Goals and Targets of the 2030 Agenda for Sustainable Development. The slogan of Agenda 2030, which aims to end poverty and protect the environment, is ‘Leave No One Behind’. There are many high-level and informative side events to attend, a chance to meet high-level speakers, and learn about what is happening all over the world to move Agenda 2030 forward. I attended as many of them as I could and, wherever possible, brought up palliative care. My challenge as advocacy officer at the HLPF was to describe palliative care as a healthcare service appropriate for countries at all levels of development that improves quality of life and allows individuals and their families to participate in sustainable development. This year, the HLPF was discussing Goal 3, ‘Healthy Lives for All at All Ages’, among other Goals. Because governments agree that impoverished, unhealthy populations are a brake on sustainable development, they formulated Target 3.8 of Goal 3: ‘Achieve universal health coverage, including financial risk protection, access to quality essential healthcare services and access to safe, effective, quality and affordable essential medicines and vaccines for all’. The World Health Organization (WHO) definition of Universal Health Coverage (UHC) includes ‘palliative care’ as an ‘essential health service’. And, of course, palliative care requires access to affordable essential medicines such as morphine. Provided at the community level, palliative care can reduce out-of-pocket expenses to the family, and costs to the government and health services. The argument is that scarce resources that might otherwise be spent on ineffective or inappropriate treatments could be better spent on appropriate pain relief and psychosocial services that allow family members to return to work and school. This helps them avoid what health economists call ‘the health poverty trap’. A good outcome of HLPF was that civil society groups, representing those who are most left behind in development policies (older persons, women, people with disabilities, indigenous peoples, and youth), gathered together to develop strong platforms for 2018 and beyond. I made a statement at the end of a side event on Universal Health Coverage, chaired by the new WHO Director, Dr. Tedros Adhanom Ghebreyesus, congratulating Uruguay (whose Minister of Health was a panelist) on their palliative care provision under UHC. There is a lot more work to be done though to develop palliative care literacy at the United Nations! With your help, IAHPC and partners can help governments and partners meet those challenges! For other reports on the HLPF, with more detail, click here.